Conic System is always developing new solutions, and the last one, is the new Trays Destacker DGR. As a novelty, permits to use different type of trays like Thermoformed plastic, Polystyrene, Inserts and the new Thermos Formed Double Trays System DTS. The Trays Destacker DGR uses the new generation of Claws Plates with the new rapid connection system. A unique plug connects the compressed air and the electronic signals. And, with a simple quart of turn, the plate becomes set in position sparing time and simplifying the use of this kind of trays. The operation is fast and with high performance. The adjustments are motorized like in the new series 300 and managed by the Touch Screen Control Panel with a memory for all the trays. 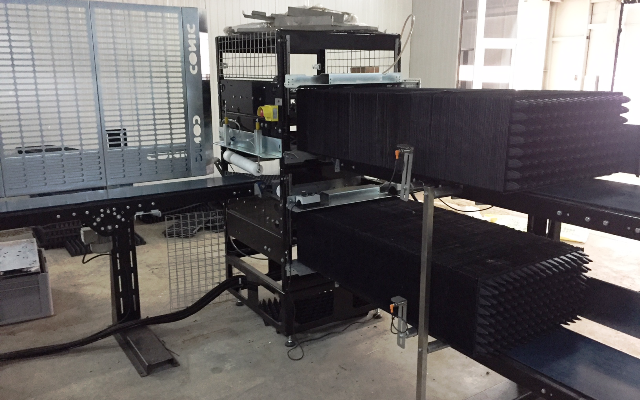 The new Trays Destacker DGR is modular and can be composed by a Two Levels Lung, the first for the base and the high for the tray, and 2 synchronized destackers, to destack the DTS Trays. To work with inserts, the destacker is composed with a first polystyrene hard trays destacker and a second DGR with a single lung to get the inserts inside the trays. And finally, to work with flexible thermoformed plastic trays, the DGR has a single lung getting the trays on the belt to the Seeder Line. If you need to stack or destack your trays, contact us by phone or e-mail to sat@conic-system.com ad we will propose one of our solutions. Conic System contributes to the construction of the first modern mechanised nursery in Syria.